Prime Minister Imran Khan on Friday defended himself against the opposition’s allegation of taking U-turns, saying that the person who did not take decisions according to the situation was not a true leader. Talking to columnists at the Prime Minister Office, Khan said that after completing the first 100 days in office, the government would unveil an all-inclusive and comprehensive programme for the country, covering education, health, poverty reduction and other sectors. “One who doesn’t take decisions according to the demand of the situation is not a true leader. [Adolf] Hitler and Napoleon [Bonaparte] would not have suffered losses if they had taken U-turns,” he said. However, referring to former prime minister Nawaz Sharif, Khan said Sharif did not take a U-turn in court but he lied in the National Assembly. 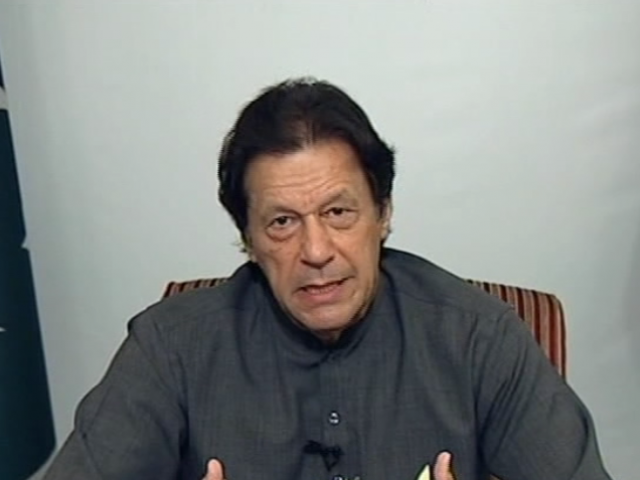 Prime Minister Khan described the first 100 days in government as an important milestone, which would determine the future course of the government. “First 100 days of any government give an outlook of its future direction. These 100 days are important in a way that this period helps reveal to the masses, the future course of government and its policies,” he said. Khan regretted that no efforts were made to strengthen democracy in Pakistan. “Instead of democracy, the trend of kleptocracy was promoted in the country where the rulers continued to use the government for their personal gains,” he said, adding that cronies were appointed in institutions so that they did not hinder the corruption of the ruling elite. According to Khan, an estimated $1 trillion was transferred from the poor nations to the rich countries and Pakistan was among those countries from where the elite transferred wealth through money laundering. He added that curbing money laundering was a priority of the government because it cost the country $10 billion every year. “Despite all the foreign aid received so far, Pakistan is still considered as a Third World country. It is unfortunate that we still do not know as to how much resources we have. No effort was made to explore resources,” he said, adding that only 6 per cent of Pakistan’s oil and gas reserves have been utilized so far. Talking about the 2018 election, the PM said that Pakistan Tehrik-e-Insaf (PTI) faced defeat on some 55 seats – 14 National Assembly and 40 provincial assembly seats – with the margin of just 3000 to 4000 votes. “The government gave a clear offer to the opposition for opening of any constituency about which they had any complaint,” he said. “Some people know … when all facts will come in the open what would be their future,” he remarked. He said that Jamiat Ulema-e-Islam-Fazl (JUI-F) chief Maulana Fazlur Rehman and other politicians were making hue and cry because they knew that after their rout in Khyber Pakhtunkhwa, they would be defeated in other areas of the country also. He said the PTI was re-elected in K-P with a two-thirds majority otherwise the province is known for not re-electing any political party. “The reason is the people-oriented work of the PTI government in the province,” the premier said. Talking about the economic situation, the prime minister said the government tried its utmost to cope with the issues of fiscal and current account deficits. “The issue has been addressed for the time being with the support of friendly countries,” he said, as he described his China visit in the first week of this month as successful.